Our first two years cruising (depicted in the map above) covered 12,275 miles between Florida, where we bought Moonshadow, Maine, the Eastern Caribbean as far south as Grenada, Panama, Costa Rica, Mexico and San Diego. The next two years, we wintered in Mexico and returned to San Diego Yacht Club and Catalina for the summer months (depicted in the map below). While in Mexico, we've enjoyed cruising both the Sea of Cortez, primarily on the lower, inside portion of the Baja California peninsula, and Mainland Mexico, using the lovely little fishing village of La Cruz as our home away from home. With so much more to see and do in Mexico, it was with mixed emotions that we put Mexico in our wake for it is from here, La Cruz, that we launched the next phase of our voyage. April 1, 2016 (or so) our plans start with a crossing of the Eastern Pacific Ocean (and the equator) to the Marquesas Islands, with visits in the Tuamotu and Society (Tahiti - Bora Bora) island groups in French Polynesia, the Cook Islands, Tonga and finally New Zealand. On March 30, 2016 we left La Cruz, Mexico headed for the South Pacific, or the Pacific Puddle Jump, as it is called. Our passage to the Marquesas ended 16 days, 8 hours later at the island of Tahuata, near Hiva Oa. Since then, we've island hopped through the Marquesas, the Tuamotus, and the Society Islands in French Polynesia. A four day, 700 mile passage from Bora Bora took us to Suwarrow Atoll in the Cook Islands; then another four day passage, covering 745 miles brought us to Tonga. 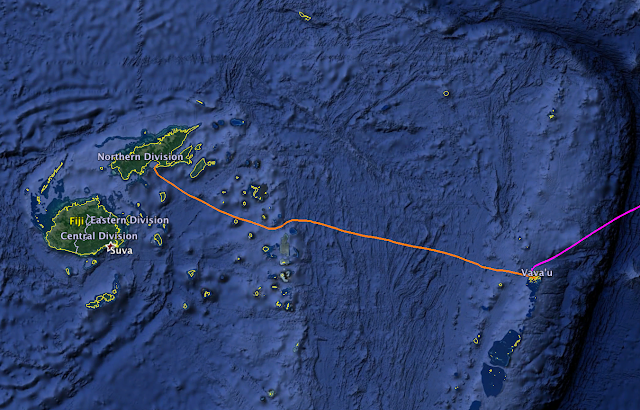 Next it was 420 miles to Savusavu, Fiji. 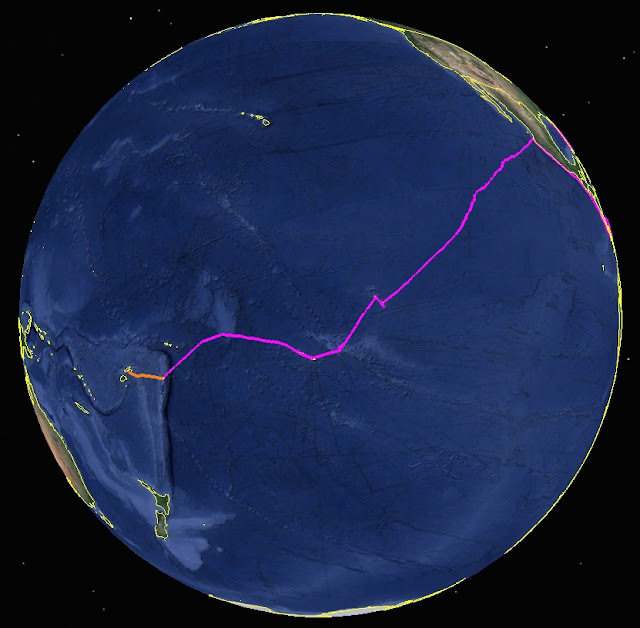 It is starting to get difficult to depict our Pacific passages on one snapshot of Google Earth! 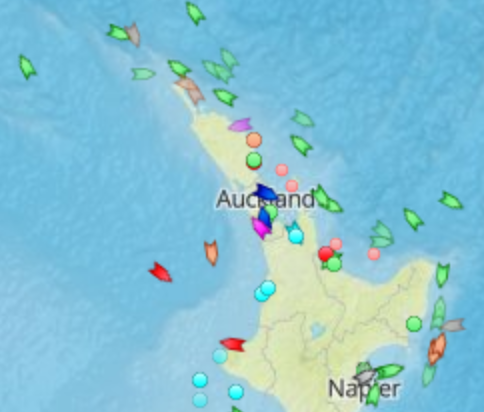 So now we are in New Zealand. In eleven months of cruising the 2015-2016 season, we've covered 9,843 miles with 53 days 5 hours, an average of about 186 miles per day or 7.7 knots. Additional statistics are below. Check out the Moonshadow Tracker on the left or click here to see where we are now. 12 U.S. states and one U.S. territory visited. 589 nights anchored at 236 places. 837 nights in 57 marinas. 77 nights on moorings at 24 places. Furthest north 44° 21.42' N - Somes Harbor, Maine. Furthest east 060° 57.5' W - St. Lucia, West Indies. Furthest west 172° 42.4' E - 190 miles north of New Zealand's North Cape on Passage to NZ. 3,405 hours under way (that's about 10 % of our time aboard). 336 voyages averaging 74.4 miles & 10.13 hours. 97 nights on overnight (24 hours or longer) passages, totaling 15,555 miles. 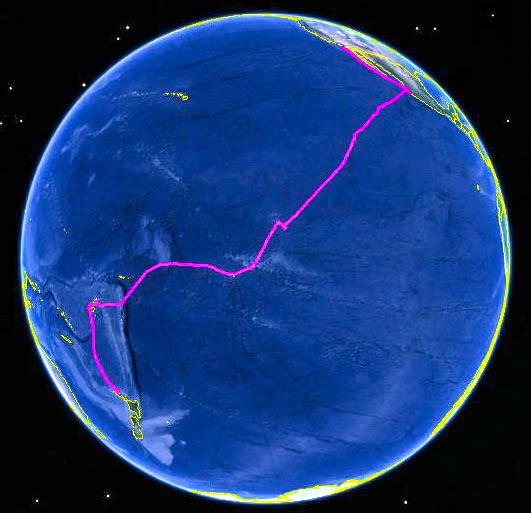 Longest - 2,850 miles - 16 days 8 hours - Mexico to Marquesas. 18 24-hour runs of 200 miles or more. 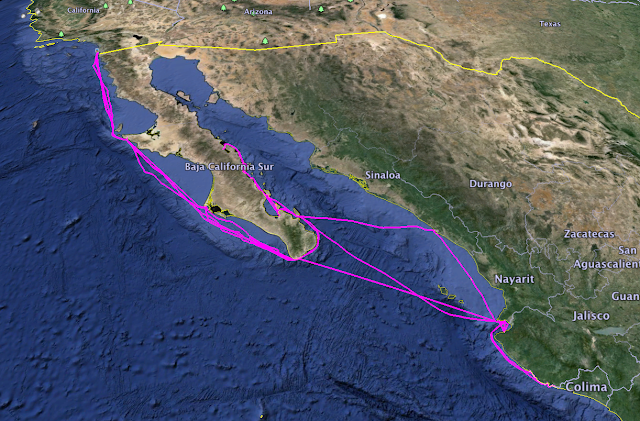 Best 24-hour run - 233 nautical miles Costa Rica to Mexico. Top speed - 17.9 knots. Moonshadow has Garmin GPS Chart Plotting equipment which saves our tracks. In the Caribbean, we learned that we can also download the track to our computer, upload it to Google Earth and save the file for presentation here.